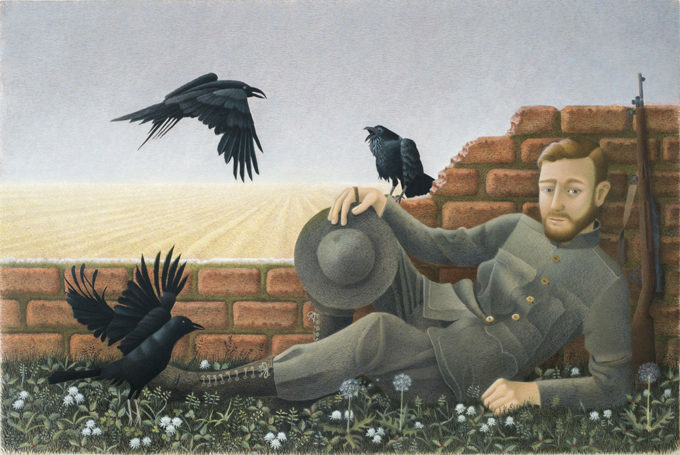 “Dona Nobis Pacem” by Eileen Kennedy, egg tempera. 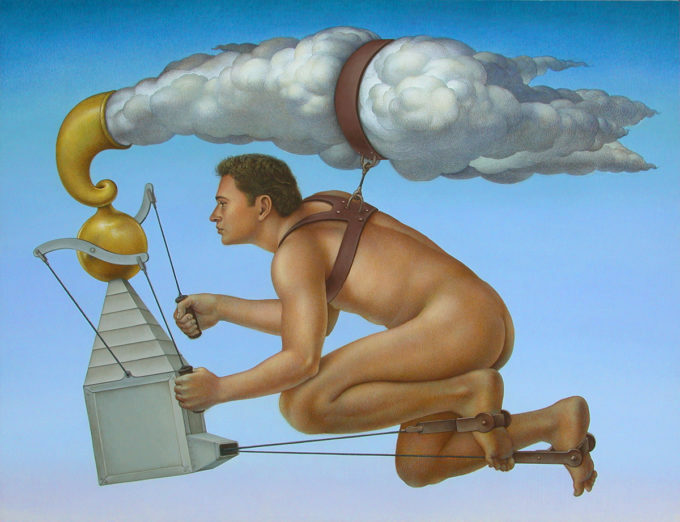 “Imagination” by Michael Bergt, egg tempera. Egg tempera is a mystical medium as it has roots in the early Renaissance. During this time period, such artists as Giotto, Piero della Francesca and Fra Angelico were paying homage to the deity and angels. The medium sanctified nature and all that it touched in its pictorial plane. Naturalism played an important role on the depiction of sacred themes. The act of creating these magnificent jewel-like paintings was accomplished through simple media: the yolk of an egg, ground powdered pigments and water. Mixed together and applied with tiny brushstrokes, which layered color upon color, an artist could achieve translucency and opaqueness. The weaving of brushstroke and tempered paint created exquisite iconic artworks. The nature of the tempera medium is open for experimentation as well as continuum with ancient practices in our modern day. The eight artists in this exhibit have conceived new stories which are documented through the medium of tempera. Michael Bergt’s work features the human figure, integrating classical myths, sensuality, and the human condition. Jon Gernon draws inspiration from the Renaissance, drawing on symbolism and combining it with magic realism. Both Carol A. O’Neill and Banjie Nicholas are drawn to nature, weaving birds and leaves into their picture planes. Jennifer Knaus marries female iconography with quirky elements of nature; she is interested in tapping into the subconscious. Eileen Kennedy’s painted narratives come from dreams and memories to create stylized figures caught up in shallow spaces. Lastly, Diane Savino weaves nature with human nature, creating commentaries about journeys, desires and sanctity. This exhibition offers fresh approaches to a medium that the Italian writer, Cennini Cennino, wrote about in his treatise in the 1400s. The participating artists feel a kinship with the ancient medium, drawing inspiration from early masters and continuing their artistic lineage. Top image: “Girl with Zinnia” (detail) by Jennifer Knaus, egg tempera. COMPLETE PROSPECTUS IS NOW LIVE! Animal Magnetism – Selections from the Attleboro Arts Museum’s Permanent Collection presents the Museum’s own menagerie to the public from February 13th – March 2nd, 2019. Featuring paintings, prints, and sculptural forms, the exhibition explores the animal kingdom, beloved pets and the profound relationship between humans and working animals. Gallery-goers during Animal Magnetism are encouraged to test their knowledge of animal breeds depicted in the exhibition. Select works will be accompanied by a plaque bearing a QR code that uncovers the breed on display. Name That Breed is presented in partnership with the MSPCA-Angell Animal Medical Center, Boston. MSPCA-Angell veterinarians and have volunteered their time and expertise by authenticating the breeds on view. Image: Detail from Barnyard Scene with Chickens by W.T. Robinson (American, 1852 – 1934), oil. The Attleboro Arts Museum is honored to commemorate the life, work, and exceptional talent of artist Edmonia Lewis by launching the Edmonia Lewis Art Education Scholarship. The scholarship is funded by The Reynolds Family and the Museum and is open to African American children, teens, adults, and adult/child pairs. It is administered by The Rev. Dr. Martin Luther King, Jr. Memorial Committee of Greater Attleboro. The Edmonia Lewis Art Education Scholarship is designed to assist students in obtaining visual art instruction and exposure to the wonders and challenges of art and art-making. No previous experience in an art studio is required to apply. The Review Committee typically selects 1-4 full tuition scholarships per year. Art classes will range in size from a one-day workshop to a multiple-week, hands-on art studio experience. The first Reynolds Family & Attleboro Arts Museum Edmonia Lewis Art Education Scholarship was awarded on Martin Luther King Jr. Day 2019 to Ms. Jadyn Boyd. Edmonia Lewis was the first sculptor of African American and Native American descent to achieve international recognition. Her father was African American, and her mother was Chippewa (Ojibwa) Indian. Orphaned at an early age, Lewis grew up in her mother’s tribe. In 1859, she attended Oberlin College in Ohio, one of the first schools to accept female and black students. She developed an interest in the fine arts, but an accusation of poisoning, believed to be racially motivated, forced Lewis to leave the school before graduating. She traveled to Boston and established herself as a professional artist, studying with a local sculptor and creating portraits of famous antislavery heroes. Moving to Rome in 1865, she became involved with a group of American women sculptors and began to work in marble. In addition to creating busts, Lewis sculpted biblical scenes and figurative works dealing with her Native American heritage and the oppression of African American people. All applicants will be notified of scholarship award results 6-8 weeks after receipt of a complete application. A prestigious, annual group show spotlighting 8 member artists. Our Members’ Show guest juror then reviews the artist’s Members’ Exhibition submission(s) and invites up to 20 applicants to submit a digital portfolio of 12 works for further review. 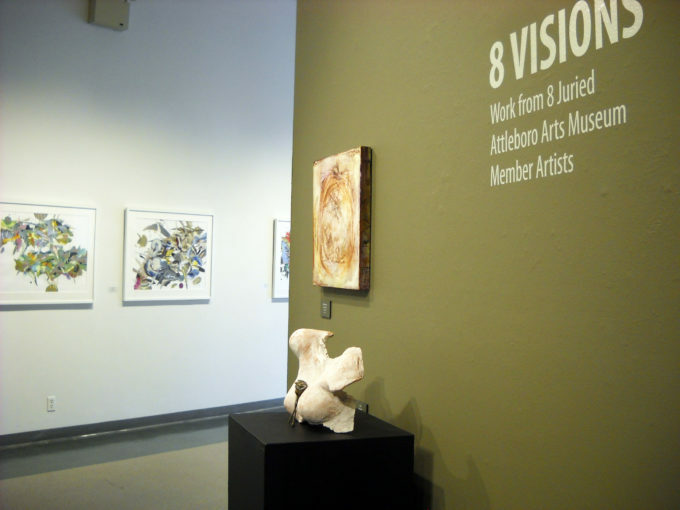 New guest jurors will then choose the 8 artists for the “8 Visions” exhibit held each summer. If selected, “8 Visions” artists will have the opportunity to exhibit approximately 8 works in the Museum’s Ottmar Gallery for a month-long group show. Exhibited work must never have been shown at the AAM. Top: “8 Visions” 2015 title wall with the work of Lindsey Epstein. Artist Jeanne Sturim at the “8 Visions” 2015 Gallery Talk. “8 Visions” 2017 exhibition. Pictured: Work from Wilson Hunt, Betty Harrington and Elizabeth Lind. The Attleboro Arts Museum’s Art Lovers Book Club launched in January 2010. A dynamic Museum member proposed this artful Book Club idea and the program was launched on a trial basis. After the success of the first meeting it was clear that the Book Club should live on. 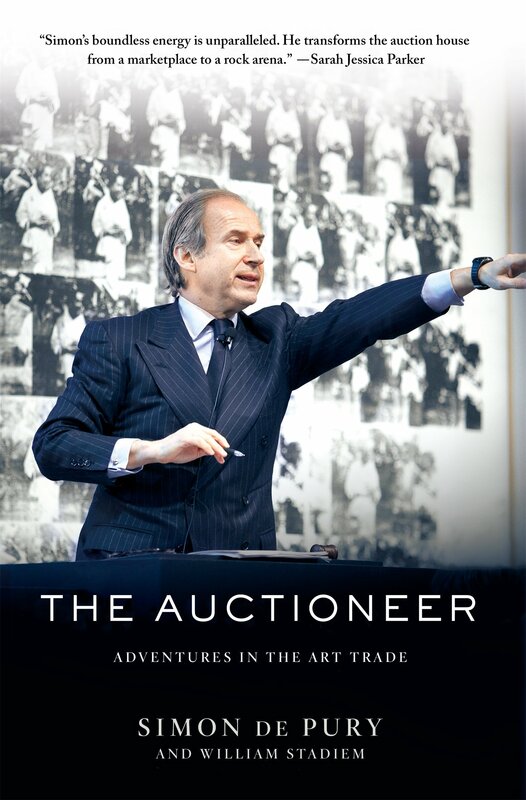 In “The Auctioneer,” Simon de Pury, a distinguished auctioneer and art dealer, provides an account of his flashy career and today’s soaring art market, revealing a jet-setting, powerful, and private club of elites who buy, sell, and collect the world’s most expensive art. 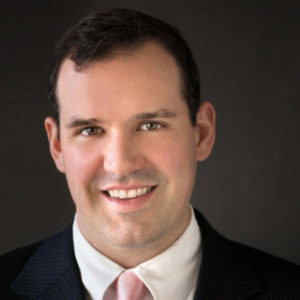 Speaker: Chris Barber, Deputy Director of American Furniture & Decorative Arts at Skinner Auctioneers and Appraisers. Reservations are not required, but are appreciated. Please call 508-222-2644 x10 or email office@attleboroartsmuseum.org by October 19th. This event is free and open to readers of the book – as well as those that are interested in the featured topic. Chris Barber is a specialist in Skinner’s American Furniture & Decorative Arts Department. His special areas of interest are American furniture and 19th century folk art. Chris has also had experience working with 18th and 19th century American clocks, nautical and maritime art and antiques, and cataloged an extensive collection of early microscopes. Chris joined Skinner 2004, and since that time has expanded his role to include auctioneering. An avid supporter of the arts, Chris is a member of the Museum Council at the Museum of Fine Arts Boston, and often lends his talents to supporting art and antique appraisal events for non-profit and corporate institutions. Prior to joining Skinner, Chris was a member of the American Paintings and Sculpture Department at Christie’s auction house in New York. He has served as the auctioneer at the Attleboro Arts Museum’s Benefit Art Auction for the past several years and, by popular demand, will be leading the Museum’s 2017 Auction on November 4th. Chris earned a Bachelor of Arts degree in the History of Art and Architecture from Harvard University. He currently resides in Boston, Massachusetts. 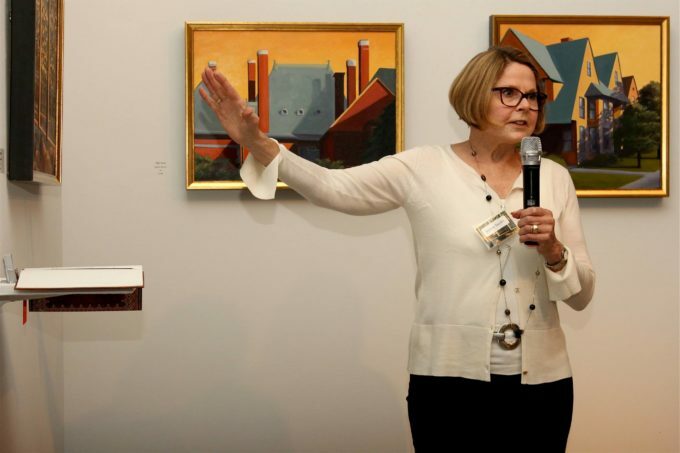 The Attleboro Arts Museum’s 26th Benefit Art Auction Spotlight Exhibition. 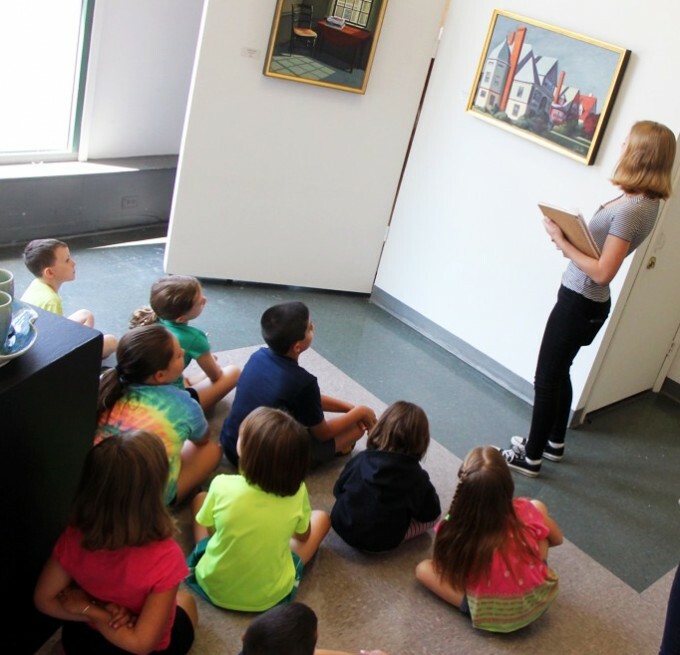 Attleboro Arts Museum Teen Docents lead museum tours and educational experiences for children and families. Teen Docents are volunteers that come from all backgrounds and interests, but they all share a common passion for art and engaging with children and families. All docents will receive free training from Museum staff. No prior museum experience is required. This program is open to students in grades 9 – 12. The Teen Docent Program is a community service opportunity. Participants gain service credit during the summer and school year. A teen docent, Liz, discusses the work of “8 Visions” exhibition artists with young art campers. With seven or more individuals, you can design your own custom art class at the Attleboro Arts Museum. We have wonderful instructors who specialize in everything from drawing, painting, ceramics, and more! There is a maximum of 12 individuals per group. The Attleboro Arts Museum is happy to coordinate with each group on scheduling a custom art class. Of note: custom art classes are subject to scheduling constraints due to Museum programs, exhibitions and events. Please contact us at least 1 month in advance for booking a custom art class. Your custom-designed art class will go at your pace and focus specifically on your group’s interests and creative goals. We can accommodate any age group and any skill level. All you need is the desire to create! Students under the age of 17 must be accompanied by an adult (18+ years). Full payment and Museum School Handbook signature pages are due 2-weeks prior to the start of your custom art class or workshop. TO SCHEDULE A CUSTOM ART CLASS: Please contact Abby Rovaldi, Programs Coordinator at 508-222-2644 x15 or arovaldi@attleboroartsmuseum.org. The Museum is handicapped accessible. Parking is free in our convenient lot.